Theresa Gilday-Biela thought she could withstand everything that nature threw at her. She lived through Hurricane Rita in 2005. 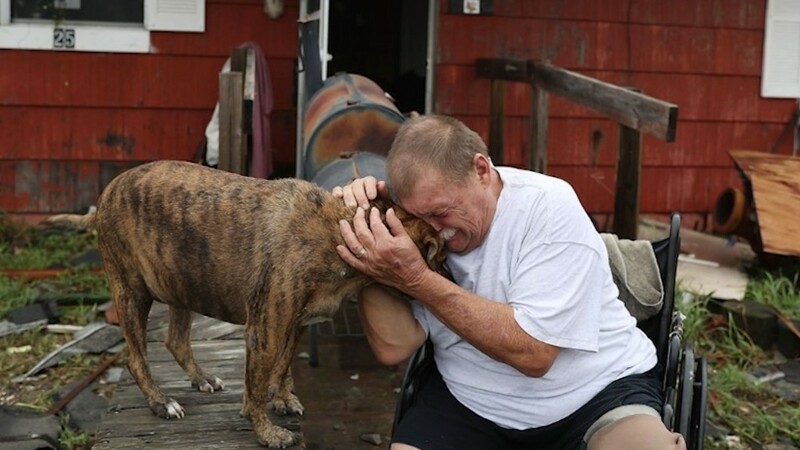 She lived through Hurricane Ike three years later. But never has she experienced waters like what Hurricane Harvey brought down on her Friendswood, Texas rental home this week. The initial rainfall wasn't too bad, she said. But then it kept coming. "Next thing we know, it started pouring in again. And this time, it didn't stop," the 69-year-old grandmother told CNNMoney. "When they took me out of the house, it was up to my neck." Rescue crews saved Gilday-Biela and her husband early Sunday, and they're staying with their daughter for the time being. But any hope of returning to their old lives is gone. Everything they own is underwater. Gilday-Biela's husband, Benjamin, hasn't been able to work for a week, leaving them without his paycheck. They also don't have flood insurance. "We have no savings. We have nothing," Gilday-Biela said. "I don't know what's going to happen." Their plight gave Gilday-Biela's sister an idea. Earlier this week, Bonnie Gilday Simon created a GoFundMe page to solicit donations for the couple. She raised about $1,300 of a $10,000 goal by midday on Wednesday. Hundreds of people have turned to the crowdfunding website in recent days to solicit donations for victims of Harvey, which is now a tropical storm that is expected to keep dumping rain on parts of Texas and Louisiana. The storm has dumped more than 50 inches on parts of the Gulf Coast and triggered massive flooding. Some of the crowdfunding efforts are massive in scope, like country singer Chris Young's $500,000 campaign for general relief. Others pledge to provide meals to hurricane-stricken areas or help pets that were displaced by the storm. All told, there are about 850 Harvey campaigns that have raised $4.5 million so far, said GoFundMe spokesman Bobby Whithorne. Whithorne said the website has a long history of organizing individual campaigns in the wake of disasters. Last year, $11 million was raised for victims of flooding in Louisiana. Recent campaigns for victims of wildfires in California and an earthquake in Nepal also raised several million, he added. Whithorne said the company has checks in place to prevent fraud and ensure that donations are properly used. Before any money is transferred to a person, GoFundMe verifies their bank account information. Donors can also report misuse and receive their money back, he said. For several of Harvey's victims, a crowdfunding campaign brings hope of relief, even if it's only temporary. Elise Gibson, for example, is trying to raise money for a car. Even though her house in Katy wasn't in a floodplain, the first floor is filled with sewage water. Gibson and her husband swam out of the neighborhood Monday with their two young sons floating on an air mattress. "My garage is fully submerged. Our two cars are gone," she said late Tuesday. While they have a second home about 60 miles outside the city, they have no way to get there. Car dealerships aren't open, and Gibson said she can't find a car rental service that is open right now. While the cars at her home are insured, she has no idea when she'd be able to recoup her losses. "Geico is telling us that they need 10 days to get out to assess our vehicles," she said. "We've been told that our homes will be underwater for two-to-three months." A colleague started a GoFundMe page for Lorenzo Marquez after he was forced out of his Houston home with his wife and five children. Marquez didn't live on a floodway. Like about 85% of Harris County -- including everyone in this article -- he doesn't have flood insurance. "It never flooded before. We were told it wasn't required because we were not in a flooding plain," he said. "We were told not to worry about it because of that." Now Marquez is trying to help his family survive the week. After leaving his home, he and his family holed up in an apartment complex about a quarter-mile away. Floods continued to threaten the family, though. They escaped on a boat and jet ski, and by Wednesday were staying with in-laws across town. Marquez said his priority was caring for his children, including his three-month-old baby. "They are small enough to still think of life under a different meaning and they think that they are on vacation," he said, adding that he helps them daydream about better circumstances. "Right now we're on a cruise ship." Marquez says he's not sure how much his expenses will ultimately cost. Water damage destroyed the first floor of his home. He said all of his furniture, appliances and electronics were ruined. The campaign started on his behalf has raised more than $40,000 of its $100,000 goal. Marquez also said he wants to organize another charitable effort. The organization he chairs, the National Kitchen & Bath Association, is putting together a relief fund for members in the area who are affected by Harvey. "It's just citizens coming together to support one another and to to be there to lift each other up," he said.